Ever heard the famous Hippocrates quote? You know. The one about food being medicine? There are some dietitians who are completely against anyone saying food is medicine. I get it…Food can sometimes be taken out of context of a whole diet. That’s when you start to get people overly stressed or overwhelmed about any and everything about food – thinking they will get a chronic disease after one bite of something deemed “unhealthy”. While I agree that someone who has a very disordered relationship with food shouldn’t focus on the whole “food is medicine” idea, I think denying the power of food is a waste. Some people can genuinely be scared of food – which is not a healthy thing and can get really scary really fast. Some can become afraid of eating the wrong things so much that they can trigger a predisposed eating disorder or disordered eating pattern, like orthorexia. Another common reason against food being medicine is that food does not act in the same way many pharmaceuticals do. Just because food doesn’t seem to fit the standard pharmaceutical, it doesn’t mean we have to completely disregard nutrition acting as medicine. There is a way to approach your food with health in mind that aligns with choosing foods as medicine of some sort. 1) The science or practice of the diagnosis, treatment, and prevention of disease. 2) A compound or preparation used for the treatment or prevention of disease, especially a drug or drugs taken by mouth. Food inherently is a series of compounds and can be prepared in specific ways to be beneficial for health and can be used as part of the treatment for certain conditions. Meds are often prescribed together with other meds – if not immediately, soon after when side effects start happening or when the meds aren’t doing as much job as expected or wanted – similar to how foods are eaten together, providing us a variety of nutrition. Yes, we can’t expect food to the be all, end all. But we can’t expect that of medicine either. We see that especially when we see pharmaceuticals on top of more pharmaceuticals on top of more. You cannot tell me that food cannot act as part of disease treatment. I use peer-reviewed research and professional experience in my nutrition coaching and while prevention of disease gets a little sticky (we can’t prove a negative), it’s pretty well known that someone who keeps a diet filled with lots of plants, healthy fats, high quality carb sources, and healthy protein usually has a better health outcome than others. Obviously there are always going to be outliers. There’s always going to be someone who ate very healthy and got cancer, and someone else who didn’t care too much about their food sources, drank a soda every day, and lived to be over 100. Disease is not just about food. There are so many other factors. But to deny food has any part is something I cannot ethically stand by. I’m not saying anyone has to be so cautious about their nutrition that it runs their life and steals joy from eating. But it’s important to understand that nutrition and humans aren’t black and white. You can come from a place of understanding the medicinal qualities of food while still having a very healthy relationship with food. I still eat cookies. I still eat donuts. I still eat ice cream. I don’t have food guilt or shame. Ask anyone who knows me and they’ll tell you I really don’t care about what you see in my grocery cart or on my plate at a restaurant. I eat foods I fully enjoy and that make me feel good. I don’t have any stress around my food choices. Was this always the case? No. Did I had to work through my issues a long time ago and I learned that dichotomous thinking is dangerous. That’s really what I’m aiming at here. 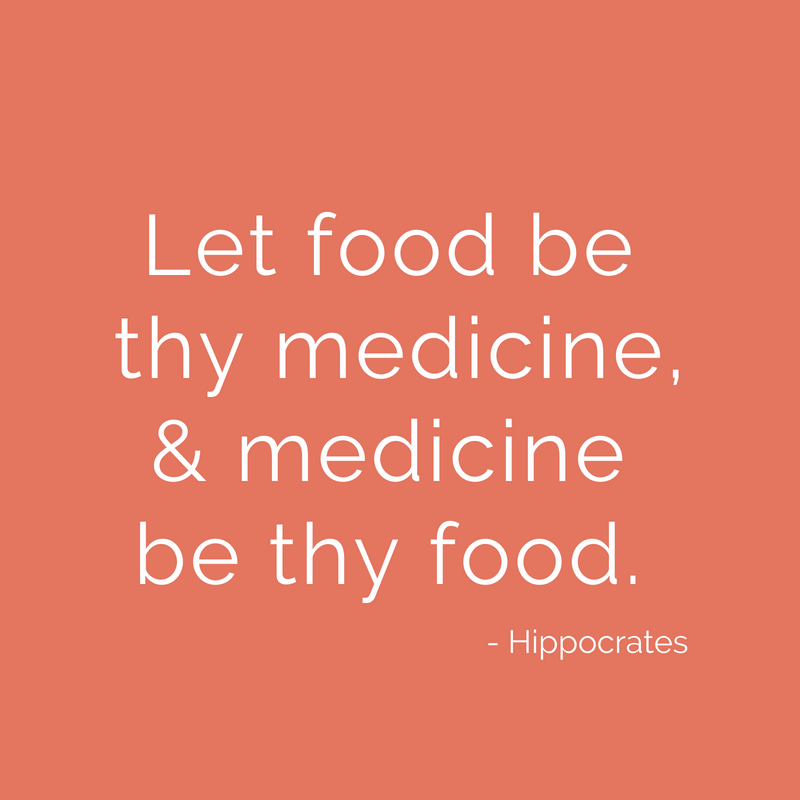 In some ways, yes, food is medicine. In other ways, not so much. Can we use critical thinking to see how food does fit into the definition of medicine but doesn’t need to be treated in the same way or overly stressed about? 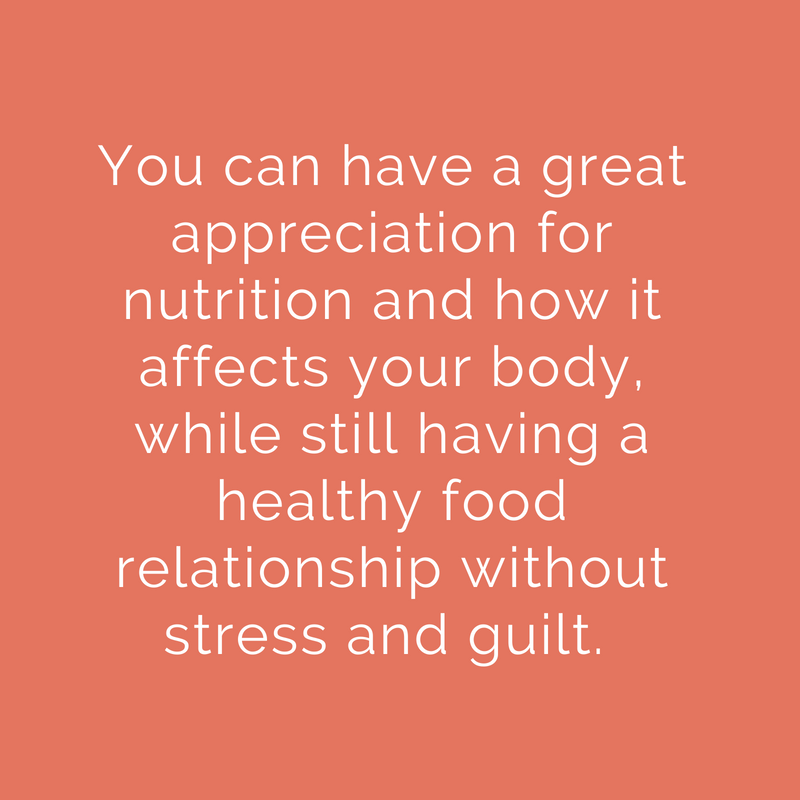 You can have a great appreciation for nutrition and how it affects your body while still having a healthy relationship with food without stress and guilt. If you want to get started on a journey to ditching the guilt around your food and working towards your nutrition and health goals, join my free 5 day plan. In the plan, you’ll get daily emails that give you the step by step foundations I use when working with 1:1 clients. Just scroll down and you free access will slide-in!